Chinese omelette dish Egg Foo Yung is the most well-known egg-based dish in Chinese cooking. Easy and cheap, Egg foo yong is also a popular Chinese restaurant and kopitiam dish in Singapore. Egg Fu Yung can be served with or without gravy. In a large bowl, add in eggs, spring onion, bean sprouts, soy sauce, pepper, salt, milk and water. Beat egg mixture until smooth and salt dissolved. Mix thoroughly. Heat 2 tablespoons oil in a frying pan. Once the oil is hot, add in onion, prawn, chicken sausage, diced mushrooms, and stir fry for around 1 minute. Pour in the egg mixture, make sure the fried ingredients are fully covered by egg mixture. Turn to medium heat. Fry until golden brown, flip and repeat for the other side, about 4 minutes. Do not overcook the eggs. Remove the omelet with a slotted spoon and drain on paper towels. Served hot with steamed Jasmine rice. I am so glad I found this recipe. We loved it. Was quick, easy and delicious. Thanks for the recipe. This omelette looks amazing! I will try this soon. Now, I’m getting hungry. Egg foo yung is definitely one of my favorite dishes. 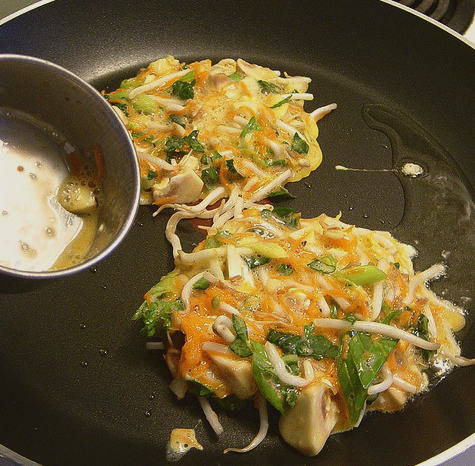 On the contrary, egg foo yung is an easy, versatile food that i can adapt pretty much however i want.